The CAPAL Research and Scholarship Committee is pleased to announce our Online Lecture Series and our inaugural lecture! The Research and Scholarship Committee is dedicated to supporting, advancing, and promoting the diverse research, scholarship, and creative activities of Canadian professional academic librarians. One of the committee’s objectives is to facilitate communication and connections within the Canadian academic librarian research community at individual and institutional levels. In line with this objective, the committee is launching a free and open online Lecture Series, which has the potential to reach librarians across Canada. The committee hopes the lectures will be a starting point to build connections and offer inspiration to librarians across the country. 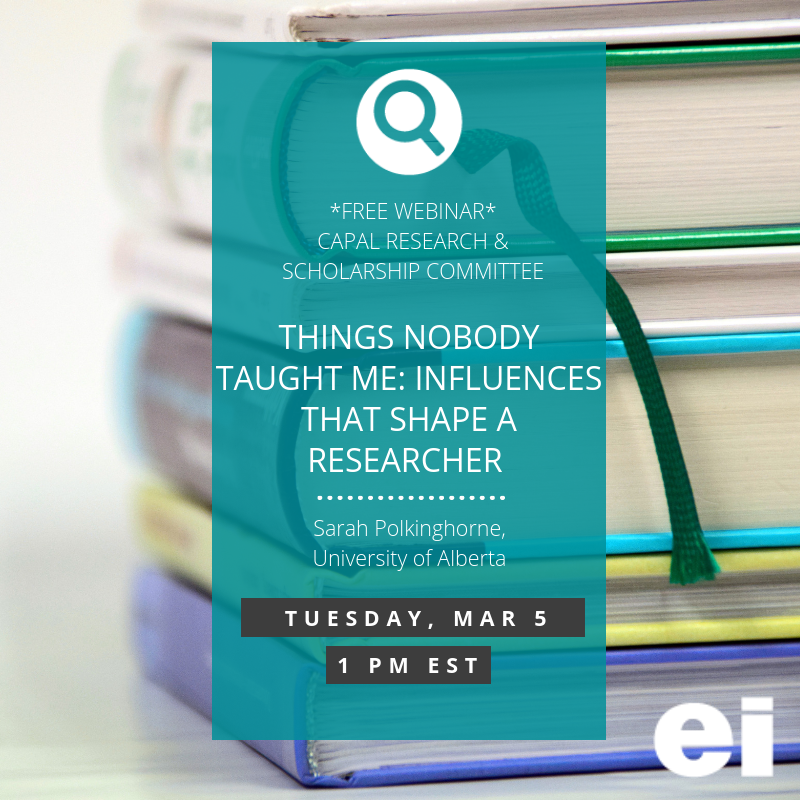 Sarah Polkinghorne is a collection strategies librarian at the University of Alberta in Edmonton and a doctoral candidate in the Faculty of Health, Arts and Design at Swinburne University of Technology in Melbourne. Her doctoral study focuses on the role and nature of information in people’s food lives. Sarah’s interests are many and include embodied and sensory information, qualitative methods, and critical librarianship. Sarah shares updates at sarahpolkinghorne.ca. We hope to see you there. Please feel free to contact Roger Chabot (rchabot2[at]uwo.ca] with any questions.